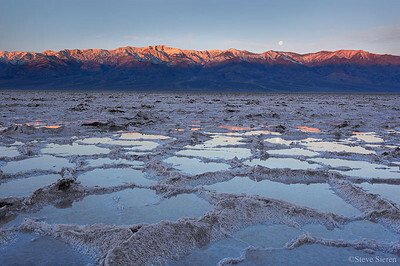 Badwater Moon The salt flats in Death Valley National Park are a very desolate and barren landscape. 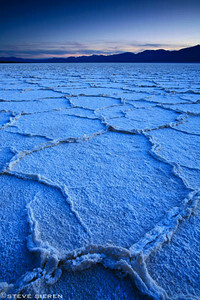 Walk out on to the salt flats and you'll see nothing for miles in all directions. They are a spectacular collection of chlorides, sulfates and carbonates that seem to be living and breathing and changing their way of revealing themselves on a daily basis. The Race Track - Death Valley Tucked in a remote valley between the Cottonwood (Panamint Range) and Last Chance Ranges, the Racetrack is a place of remarkable beauty and mystery. 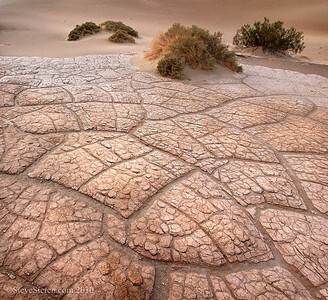 The Racetrack is a playa dry lakebed, best known for it’s strange moving rocks. 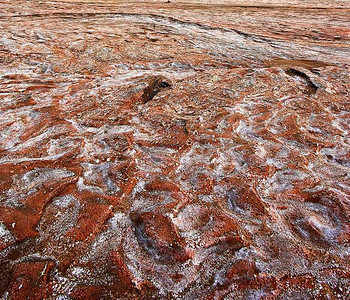 Although no one has actually seen the rocks move, the long meandering tracks left behind in the mud surface of the playa attest to their activity. 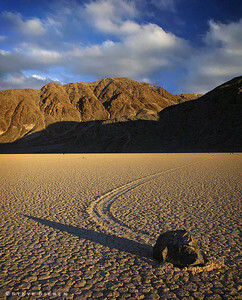 Wind is one of the factors in the mystery of the moving rocks. 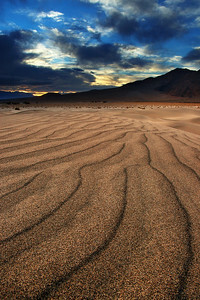 Death Valley's Mesquite Dunes with the Death Valley Buttes in the background. Located a few miles from Stovepipe Wells and a short hike from the road, these are the tallest sand dunes in California and among the highest in North America, rising 680 feet above a dry lake bed. 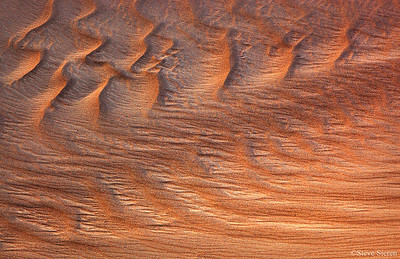 Formed by wind and sand from the Cottonwood Mountains, the sand dunes cover an area about three miles long by one mile wide. A Grand View Death Valley, CA The other point in the Valley, looking southeast, towards the southern end of Death Valley. The Black Mountains, part of the Amargosa Range, are visible across the valley in the distance. This point is actually higher then Dante's View. 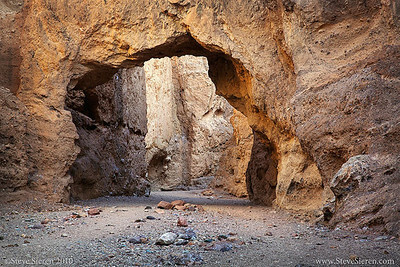 A road to it was created back in the 1920's in hopes of creating more revenue from tourist dollars. The Scale of a Sand Storm Death Valley, CA Sandstorms -- also called duststorms -- are caused by strong winds blowing over loose soil or sand, and picking up so much of that material that visibility is greatly reduced. 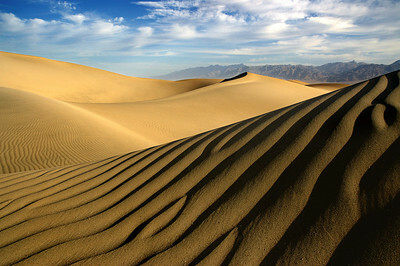 The widespread abundance of loose sand in deserts makes them the most common locations for sandstorms to form. 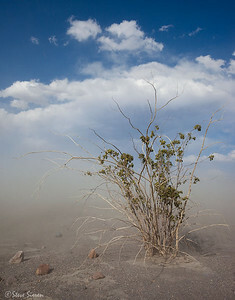 In desert regions at certain times of the year, sandstorms become more frequent because the strong heating of the air over the desert causes the lower atmosphere to become unstable. This instability mixes strong winds in the middle troposphere downward to the surface, producing stronger winds at the surface. Sandstorms are notorious for getting sand into equipment, houses, and just about every nook and cranny of everything. 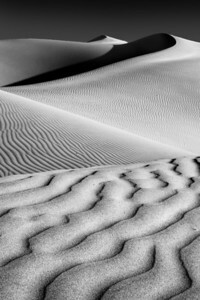 The abrasive characteristics of the sand can be harmful to machinery. 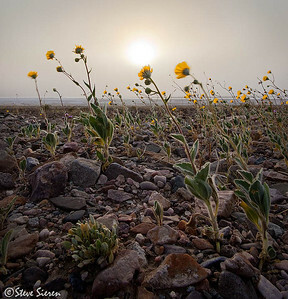 Desert Gold in the Wind Spring wildflowers bloom and carpet the desert floor with colorful blossoms. 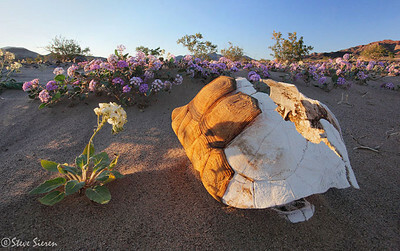 It's a wonder why it is so hard for flowers in Death Valley to try and stay alive much past their peak. Beyond the heat of the day they also have to deal with constant wind and sand storms. I really liked how the the hair on the stems was backlighting as the sun set behind a giant sand storm. It was a little tough to pull off with the dust, sand and rocks flying around. One exposure and double RAW processed. 1/30 f22 iso 50 I picked a lot of movement for a 1/30 of second. I bracketed the scene and went with the underexposed file because I could pull enough detail out of it and still get the sun to come out not too overexposed. 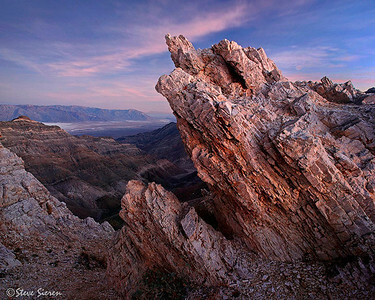 Dante's View Death Valley National Park. Approaching Storm on the lowest, driest, and hottest place in North America. 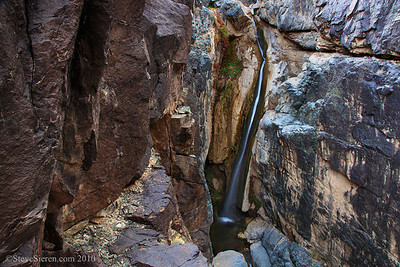 Its extreme geology provides otherworldly views that are unique unto themselves. 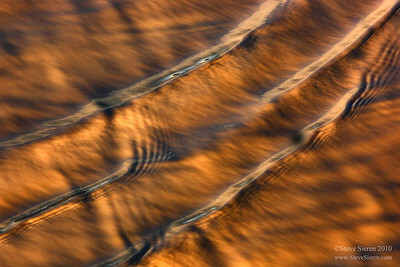 Its salt pans, sand dunes, and wild elevation changes are a feast for the eyes and the camera. The geology of the valley make this view amazing, with the salt flats below, alluvial fans across, an oasis or two in the distance. And once you're done admiring the view, look around. There are unique animals and plants around that you won't find in the valley due to the elevation. Oh, and it's a little cooler up there, so bring a sweater. 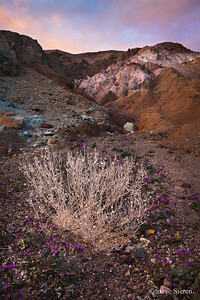 Artist's Palette Death Valley It's a brightly colored patch of sand and rock with pinks, purples, and greens that really leaps out at you against the barren desert landscape. 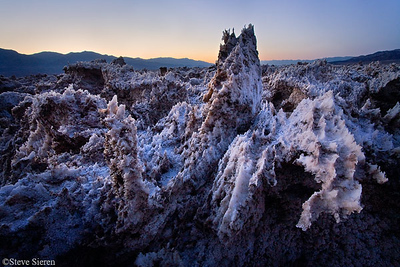 Close up view of Manly Beacon in Death Valley. 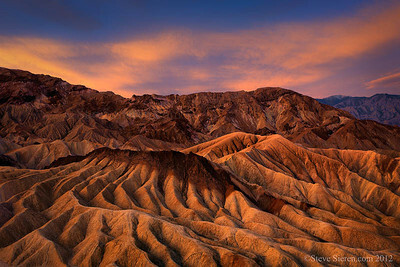 The badlands at Zabriskie Point are an old lake bottom that has risen into what you hear as a result of volcanic activity in Death Valley. Death Valley Palm Oasis This area has recently burned and no longer exists in the way seen here. Go on to page 2 to see more photos. You Will Eat Me No More Death Valley National Park The Mojave Desert Tortoise is the largest reptile of the Mojave Desert. They walk on ground that can get over a 130 degrees. 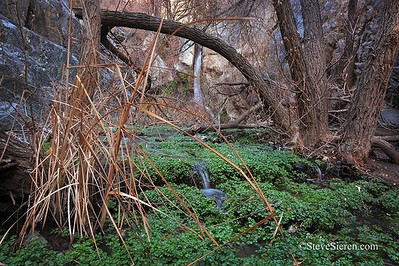 They avoid the heat in their giant burroughs where it is about 40 degrees cooler and hibernate there durning the winter. They can live for a year without water or maybe even 2 years without water. In certain areas of the Mojave the average number of tortoises per square mile in the 1920's was 100, now in the same areas there are less then a dozen per square mile in the same areas. A host of animals depend on their large burroughs for homes. It's an endangered species because it's population has dwindled in recent years. In order for it to be removed from the endangered species list it's population must grow and be sustained for 25 years. 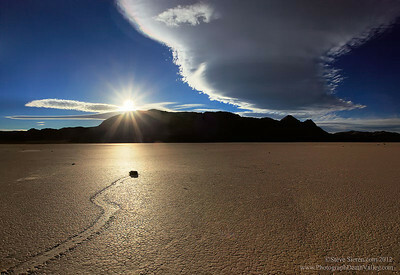 The sun sets below a lenticular cloud on the moving rock racetrack playa in Death Valley National Park. 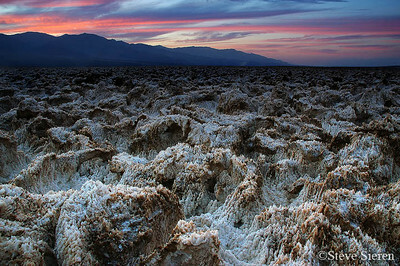 "Infinite View" sunset on the playa in Death Valley Death Valley is known for it's vast wide open and expansive landscape scenery. 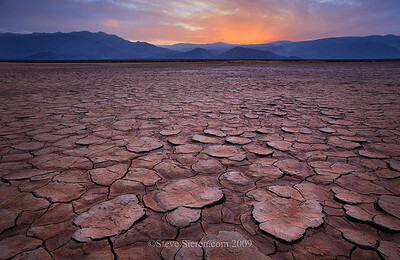 When you step onto a playa here it becomes an infinite view. 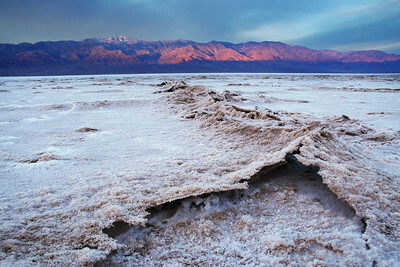 Badwater Submerged Death Valley National Park Every so many years the Badwater Basin fills from unusual amounts of rain. It is a rare occurance and evaporates quickly. 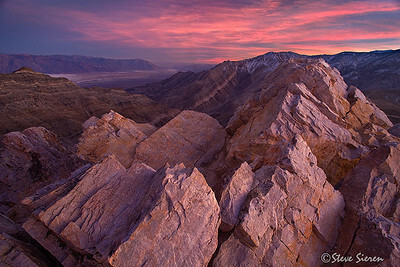 Warm Light From the South Death Valley is a strange yet breathtakingly beautiful place. 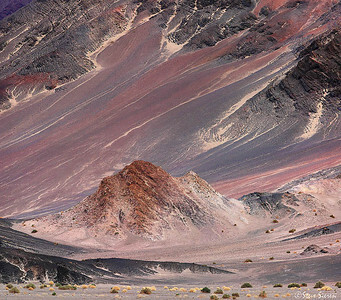 It's landscapes are unlike any other. Bracing the Elements Mojave Desert Sand storms aren't as bad as you think they would be if you're prepared. The winds were around 25 to 30 miles per hour with "GUSTS" of wind up to 50 mph. It was fun getting the back of my ears sand blasted because I was not prepared. I used my windbreaker for a camera blanket to keep the dust out of it so I was full of sand. 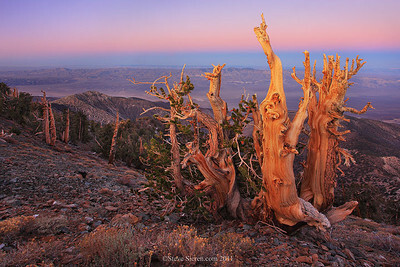 Bristlecone Pines on the slopes of Telescope Peak in Death Valley. 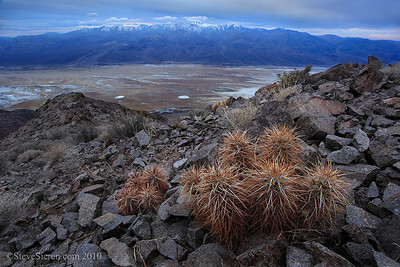 The Panamint Valley, Argus Mountains and Sierra Nevada Range are in the background. 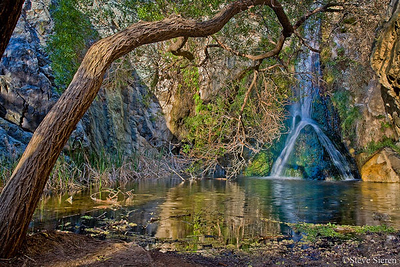 Amaragosa River Details The Amaragosa only flows for a short period during the winter and spring in Death Valley. 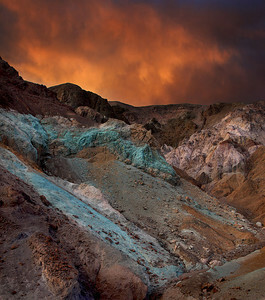 View of the badland formations at Zabriskie Point in Death Valley underneath a very colorful canopy of clouds. 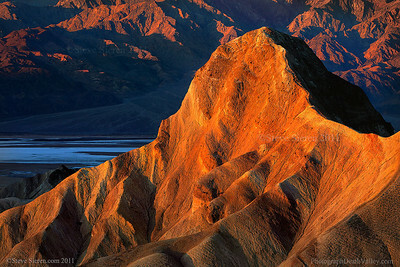 A view of Telescope Peak and Manly Beacon from Zabriskie Point in Death Valley. 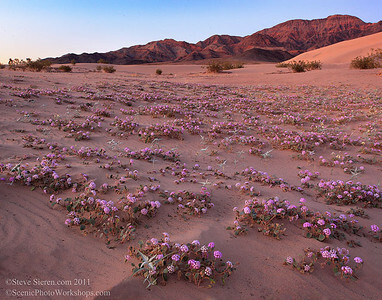 Desert Holly - Death Valley Artist's Palette is a brightly colored patch of sand and rock with pinks, purples, and greens that really leaps out at you against the barren desert landscape. 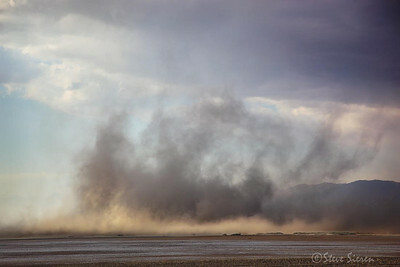 Larger then Life - Giant Sand Storm on the Salt Flats. The first small layer is about 100 feet high. 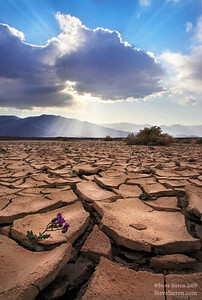 Water in one of the driest places! Golden light mixing cool light adds a little bit of mood to a scene and creates this liquid gold effect. 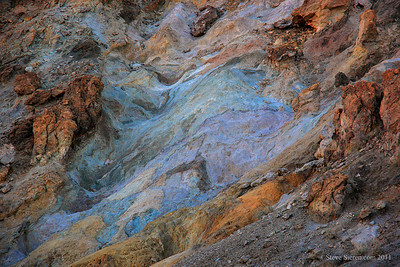 Taken out in Death Valley in the main basin there. The sun was over exposing in the scene so I had to make a few adjustments during post processing. 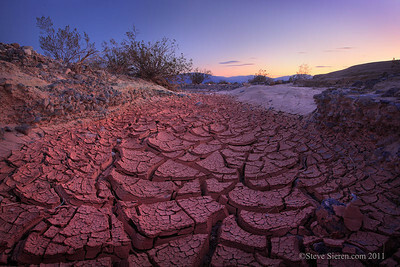 It's great to catch some water in the desert of Death Valley. 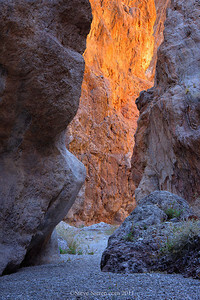 Canyon light in the narrows of a canyon inside Death Valley National Park. 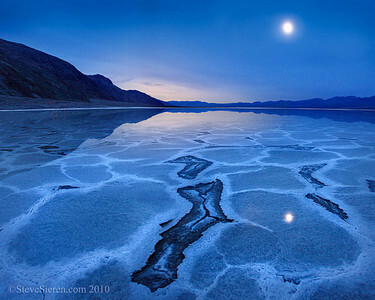 Salt flat reflection in Death Valley. 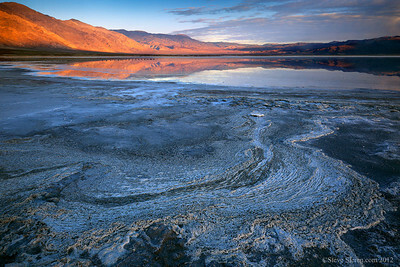 Salt lake in remote section of Death Valley. 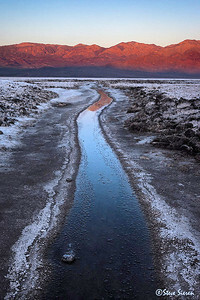 Never Ending Death Valley NP, California The hottest recorded temperature in the Northern hemisphere occurred here near Badwater at 134 degrees F in 1913, ironically the same year the most rainfall occurred (4.54 inches). 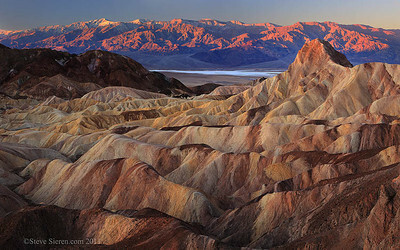 Formations and Moon at Zabriskie Point with Bennett Peak in the distance. 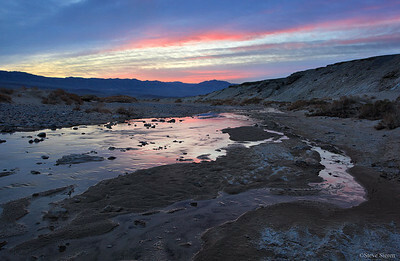 Death Valley National Park at dawn. 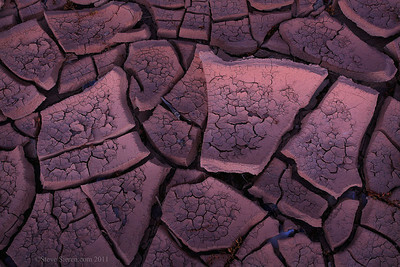 Dried and cracked mud in a wash in Death Valley. 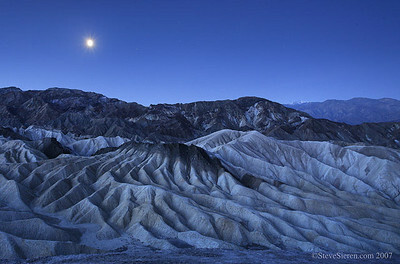 The full moon rising over the Eureka Dunes in the Northern part of Death Valley National Park.